Can techno-bebop-metal-fired instrumentals co-exist with vocal tunes inspired by the madcap geniuses of ‘60s pop? What if you added ambient soundtracks a la Morricone/Fripp and clavinet-singed funky blues from the P-Funk playbook? Top it off with acoustic ballads where smiley melodies camouflage bitter lyricism about broken love, often rendered in off-beat tunings, and you sorta begin to complete the recipe. 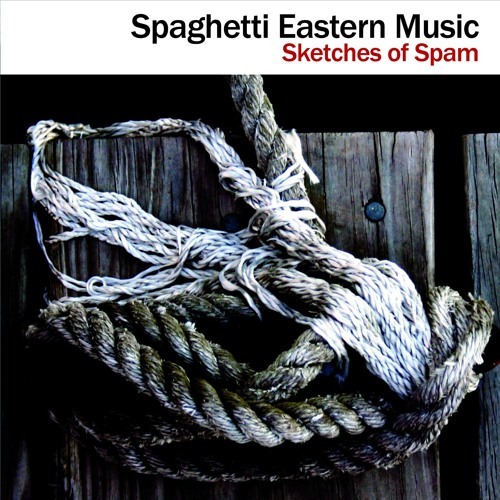 They can and do on “Sketches of Spam,” the 16-track, 69-minute, genre-surfing debut release from Spaghetti Eastern Music (Bad Egg Records, 30003), the solo project of New York City and Hudson Valley-based guitarist/keyboardist/vocalist Sal Cataldi. Cataldi’s much-varied sound is the product of an insatiable musical soul and a record collection rivaling the Smithsonian’s. This debut album is an hour-plus journey through contrasting moods, with instrumentals inspired by 70’s Miles, Krautrock, Ennio Morricone, Bhangra, Fripp & Eno and ECM’s icy guitar great Terje Rypdal giving way to bare-bones acoustic vocal tunes – ones oft anchored on unusual tunings, with narratives that chart the course of difficult loves, in styles that range from Brit Folk to Bossa. Spaghetti Eastern Music has received consistent critical raves, for live performances and the selective release of early mixes of works now fully realized on this debut disc Time Out New York writes: "Cataldi's largely instrumental, Eastern-influenced jams are infused with some delicate guitar work and hauntingly moody atmosphere." Newsday adds: “Mad scientist-guitarist-keyboardist Cataldi brings da funk and throws it in a mixer with electronica, bebop and blues.” Called “truly excellent” by The Village Voice, “triumphantly funkified” by UPI, “a stimulating soloist” by The New York Press and “a jazz virtuoso without the need to prove it” by Aquarian Weekly. East Coast Rocker/Rolling Stone writer John Swenson, the man who penned the liner notes to Frank Zappa’s “Shut Up n Play Yer Guitar,” may have put it best, “he’s the hippie guitarist playing to another dimension.” The authority on all things Beatles, The Beatles Examiner recently praised the album’s “ sharp soaring guitar jams” and called the distinctive cover of “Ticket to Ride,” “incredible, a wonderfully moody re-imagining” of the Lennon classic. Huffington Post dubs it “the perfect soundtrack for New York City life,” while WFMU’s Irene Trudel calls it “charming melodic and off-center,” a collection that is now enjoy airplay on radio including WFUV’s “Mixed Bag,” SiriusXM, WFMU, Oakland’s KALX, NYC-area college station including WCWP and WHPC and many more. The CD’s title is a lighthearted tribute to Miles Davis’ atmospheric classic, “Sketches of Spain,” one ripe for this digital overload and lunchmeat age! Prior to Spaghetti Eastern Music, Cataldi performed and recorded with a host of notables in a number of genres, including the critically-acclaimed Knitting Factory faves The Hari Karaoke Trio of Doom (an industrial/ambient jazz dub extravaganza co-led with drummer D. Hitchcock featuring Eno/Brand X bassist Percy Jones), the avant-jazz/Afro-funk band Collector, Brooklyn’s comedy rockers Frank’s Museum, Lower East Side mainstays The Trachtenberg Family Slideshow Players and in the guitar orchestra of pioneering No Wave minimalist Rhys Chatham, on his “A Crimson Grail - Live at Lincoln Center” (Nonesuch Records, 2011). He's been a familiar face in the club scene in New York, having performed at venues like CBGB, Galapagos, NorthSix, the Celebrate Brooklyn Festival, Otto's Shrunken Head, the Parkside Lounge, the Sidewalk Cafe and many more. “Sketches of Spam” was recorded largely on the waves, at the studio aboard Cataldi’s home, The Houseboat Garlic Knot, in the waters off the Big Apple. Additional recording, engineering and mastering was done at Parcheesi Recording Studios by Grammy-Award winning engineer Bob Stander (Hubert Sumlin, Patti Rothenberg), who also plays electric bass on two tracks.